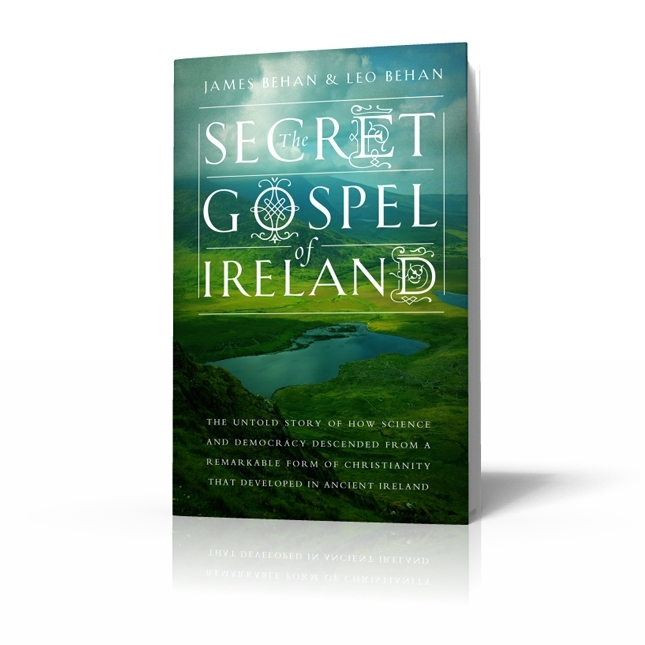 About a year ago brothers James Behan and Leo Behan published The Secret Gospel of Ireland: The Untold Story of How Science and Democracy Descended From a Remarkable Form of Christianity That Developed in Ancient Ireland. In the process of converting from paganism to Christianity, the ancient Irish developed a remarkable approach to the Christian faith that would one day make science, democracy, and our modern world possible. …With their powerful brand of “Irish Christianity,” the monks of Ireland transformed Europe and produced the key to unlocking the awesome potential of the Christian faith. The Behan brothers provided my Irish-American blog with two complimentary copies of the book, which is available at Amazon.com and other outlets. I found the book well-conceived and enjoyable to read. I shared both copies with two priest friends of mine who vouched for the theological presentation. My short email interview with the Behan Brothers follows below the book image. MH: What was the most challenging part of the research and/or writing? BB: Definitely deciding what to leave out. In writing a narrative history that spans more than a thousand years, we were confronted with a mountain of information, most of which wasn’t relevant to the story. Moreover, we realized that most events don’t lead to significant change. So we were looking for the ideas that moved civilization along toward our modern world, which required a great deal of discernment. In fact, when we started, we weren’t sure how Ireland fit into the story or where it would end. We truly followed a trail of ideas that generation after generation built upon and changed. What we ended up with was a narrative history that tells the story of how science and democracy developed out of Christianity and Ireland’s pivotal role in that process. MH: You have received some nice reader reviews and Likes on your Facebook page. Have you done any book tours or have publicity plans? BB: Most of our publicity efforts are presently focused on using the Internet and social media to reach the widest audience possible. We’re taken with how passionate our readers have been about the book. There are many reasons for the Irish and Irish-Americans to be proud. But Ireland’s crucial role in building modern Western civilization has to be among the top. The Irish didn’t just save civilization, they truly built it using the brick and mortar of Christianity. This is a main theme of the book and one that we are passionate about communicating to readers. The most effective way to do that right now is through the Internet, but eventually we would love to do a book tour or live speaking engagements in order to engage our audience directly. MH: Any thoughts on the Catholic Church and religion in general in Ireland these days? BB: With the recent election of Pope Francis, there seems to be a great opportunity for renewal and healing within the Church. Moreover, young Catholics are passionate about their faith, which is a very positive sign. The challenge, however, is to find ways to engage the majority of young people who are estranged from the faith. One place to start is history. The Irish have a long and proud history in the Church that will outlast the politics of the day. Perhaps our book will help in that regard. BB: Our next project may very well be our first project. The Secret Gospel of Ireland grew out of a book we intended to write about the Irish in America. Our research into the Irish in America brought us back to Ireland, which brought us back to the ancient world. It was like peeling back the layers of an onion. So for our next project, we’d love to continue where The Secret Gospel of Ireland leaves off and do that book about how the Irish helped build America. This entry was posted in Arts & Culture, Religion and tagged catholic church, James Behan, Leo Behan, The Secret Gospel of Ireland on June 15, 2013 by admin.